Yesterday, the EUR/USD pair lost more than 100 points due to the decline in the eurozone's economic growth forecast for 2019. The ECB lowered its forecast for GDP growth this year from 1.7% to 1.1%. In addition, the European regulator announced an increase in the volume of targeted long-term lending to banks and the transfer of the increase in the key interest rate to 2020. The actions of the European Central Bank are aimed at reducing the risks that arise in the eurozone economy. Today at 15:30 (GMT+2), investors are waiting for the release of statistics on the American labor market. At 18:30 (GMT+2), ECB representative Yves Mersch is to make a speech. At the moment, the European currency is very sensitive, and the performance of Mersch, who is likely to defend the new rate of the ECB, will increase the pressure on the pair. On the 4-hour chart, the pair is testing the lower line of the Bollinger Bands, which is the key support level. The indicator is directed downwards, the price range has expanded significantly, which indicates a continuation of the downward trend. The MACD histogram is in the negative zone, maintaining a strong sell signal. Stochastic entered the oversold zone, a buy signal can be formed within 1-2 days. Support levels: 1.1195, 1.1159, 1.1110. Resistance levels: 1.1246, 1.1286, 1.1331, 1.1376, 1.1419, 1.1448, 1.1483. 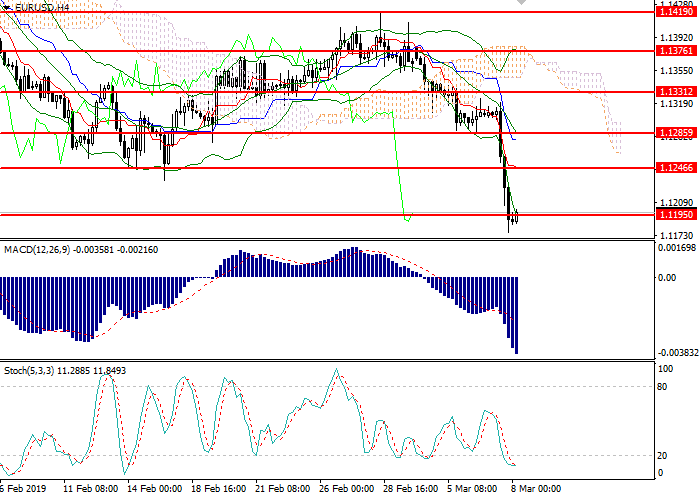 Long positions can be opened at the current price with the target at 1.1250 and a stop loss at the level of 1.1170. Duration: 1 day. Short positions will become relevant below the level of 1.1170 with the target at 1.1090 and a stop loss at the level of 1.1205. Duration: 1-2 days.